Concrete is an incredible material. Whether you are considering installing a patio, new driveway or a solid and long serving floor for your kitchen, garage or pool area the versatility and durability of concrete truly makes it a unique building material. Reside in Fishers, IN and need help or a free estimate? Give us a call. And an exceptional material such as concrete requires an exceptional contractor if you are to truly reap the benefits of it. Hello. 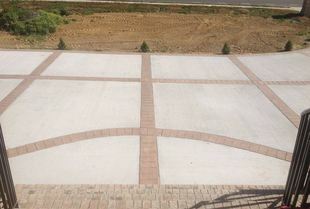 We are the suppliers of premium concrete products and services in Fishers, Indiana. If you are looking for quality and value then you don’t have to look any further – though don’t just take our word for it, listen to our hundreds of satisfied customers. Here’s just a taste of the wealth of products and services we can offer you today. There may be no home improvement product that can add value to a home as efficiently as a new driveway – typically, you could see your overall house value increase by some 5 to 10% on average after installing a new driveway. Of course, that’s only going to be the case if the new driveway is well designed, aesthetically pleasing and long lasting. Concrete driveways tick all of those boxes. The modern construction techniques we employ open up a wealth of potential designs to complement your home and neighborhood. Maintenance can be as simple as the occasional blast with a power washer and a good scrub with a stiff broom, meaning you are making an investment in increasing your homes value and cutting down on your future chores – what a combo! Ok, so if you installing a new driveway is the probably the best way to quickly increase the value of your home, installing a pool is the best way to increase the fun factor! Whether you are in the market for a brand new pool or are simply looking to upgrade your current one, we can certainly help you out here. Just like with the driveway, the versatility and durability of concrete can really come into play when you are designing and building new pool decking. Unlike wood, for example, concrete is not in danger of warping or rotting with constant exposure to water. There are also a range of non-slip products we can add to the finish of poured concrete, ensuring it is also the safest material to install around your pool. A patio can be the jewel in the crown of a well-designed backyard. After all, what can be better in the summer than rolling out the sun loungers, firing up the BBQ and having a good old fashioned cook out under the summer sun? Concrete can provide a building material that can be used to create patios with a real wow factor, and make them the stand out feature in any garden. As we’ve already discussed, it’s a remarkably robust material but it also provides a wealth of design options. 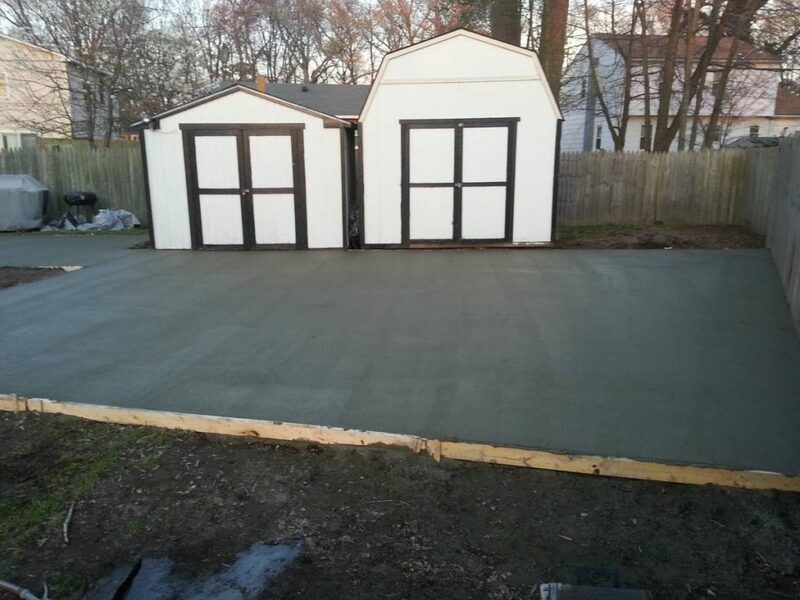 Stamped concrete is one of the services we supply – in fact, we have one of the best collections of concrete stamping tools and templates available in Fishers. 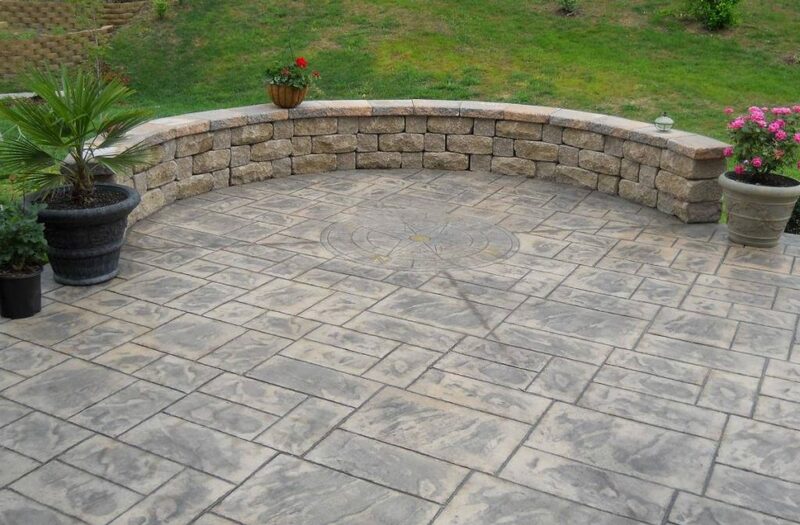 We use out state of the art stamping templates, our high end color finish products and our years of experience to produce concrete stamping to meet any design you have in mind. Natural or manmade, traditional or contemporary we have every design permutation to allow us to supply a truly bespoke product to you. Some jobs of course may not warrant the effort and time of stamping and coloring. By the same measure though, concrete that is simply poured and left to dry can be a little… boring. One of the services we off is exposed aggregate, a halfway house between the full design of stamped concrete and dull, poured concrete. With this service, we will peel away the very top layer of concrete, exposing the aggregate (small stones) to leave a pretty and completely unique pattern behind. It’s a great middle ground if you want a more interesting finish without the investment of stamping. It’s not only poured concrete products we supply. Whether 20 inch steel reinforced slabs for the construction industry right through to 2 inch thick slabs for your new path in the yard we can supply it all. Finally, we are not here simply for new construction projects. We are available for removing and replacing concrete that has simply decayed over a prolonged period. On the other end of the spectrum, if you have a concrete surface that is still structurally sound but just requires a bit of a face-lift then resurfacing could be the option for. Whether we are repairing or resurfacing however, you can trust us that we are building for the long-term. We will work with you to diagnose, and where possible repair, any underlying issues with your concrete to ensure that your investment in us will be repaid for many years to come. We have been proudly supplying concrete services and products to the people of Fishers for many years. No matter what your needs, no matter the size of your job, no matter if it’s just the basic materials or a full, bespoke service including design and installation we want to hear from you! Please don’t hesitate to get in touch, whether this is for a full quote or just an informal chat about our products or services.